The Compaq Presario CQ57-366SA won't win any awards for its looks, but does offer the things we look for in a budget machine. It's solid with a decent screen and great speakers, and the sort of internal specifications we'd expect at this price. However, even though this is a budget machine, we'd still appreciate something a little nicer to look at. The Compaq is a solid black brick seemingly devoid of colours, shades or textures. It's boring and uninspired but, as mentioned above, solidly built – with only a small amount of flex detectable around the chassis. We were also pleased to discover that it's not as heavy as it looks, but it isn't the lightest at 2.5kg. Leaving the aesthetics behind, usability is perfectly acceptable. The keyboard has wide buttons and a good depth of travel but, despite the amount of space on the chassis, feels cramped. There's no numeric keypad or quick-access hotkeys to be found, but, like most laptops, you can alter volume and media playback by holding down the Function key and using the F-keys. While the touchpad is responsive, it's also the exact same shade of black as the rest of the chassis and therefore wonderfully camouflaged. Where the Compaq picks up again is with the screen. It's got a 1366 x 768 pixel resolution, meaning you can enjoy 720p HD videos – although the full 1080p experience is out of reach. We found that although the screen was very bright, it wasn't as sharp as we've seen elsewhere. The Super-TFT coating helps, but ultimately we'd pick this for working on documents rather than watching Avatar. Having said that, the Altec Lansing speakers are very good indeed – so we'd definitely be listening to music while we worked. £350 won't buy you the greatest components on the market, but the basic user will find everything they require here. The first-generation Intel Core i3 processor is backed up by a capable 4GB of RAM and a standard integrated graphics chip that will handle video streaming from iPlayer or YouTube but stops short of advanced editing suites. There's a DVD rewriter and a standard 320GB hard drive for storing programs and media. Pleasantly surprising was the 184-minute battery life the Presario posted on our benchmarking tests. It's good to see budget laptops lasting more than three hours and, with careful usage, we reckon you could squeeze even more out. The only noticeable omission in terms of connectivity is the lack of an HDMI port for connecting to a high-definition external monitor or TV. You'll have to make do with the standard VGA Out connection or buy an adapter for one of the three USB ports. There's an SD Card expansion slot and an Ethernet port in case you don't want to use the 802.11n Wi-Fi connection to access the internet. 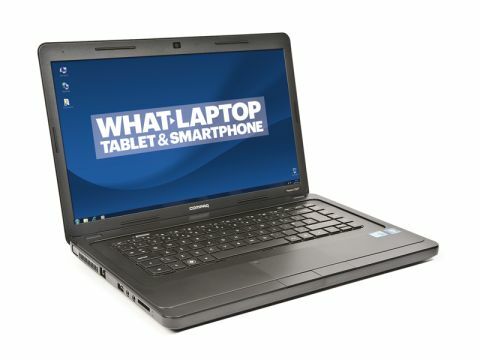 The Compaq Presario CQ57- 366SA is a perfectly acceptable budget laptop, with special mention going to the battery life and speaker system. It doesn't look, or perform, like a standout laptop and there are alternatives – such as the Acer Aspire 5742 – but if you're searching for a basic machine for the next year or two this is a good pick.